The Chic Rustique is located within walking distance to the Chutes Mont-à-Peine Regional Park and the Dalles at Sainte-Mélanie (Québec, Canada). The cottage is a casual 20 minutes drive north of Joliette in the Lanaudière region. The journey from Montréal is roughly one hour. The Chic Rustique is a small and friendly cottage overlooking a beautiful landscape and located close to a regional park where you can find several paths through hills, valleys, rivers and streams. It offers you a cozy double bed on a mezzanine and a double sofa bed is also available on the ground floor. A bathroom, a fully equipped kitchenette, a lounge, a dining table, two outdoor balconies and an outdoor fire in front of a beautiful panoramic view will give you a great experience in comfort. The Chic Rustique is definitely an affordable and cozy cottage getaway for four persons. Choose the Chic Rustique for its comfort, for the restfulness of its natural surroundings and for its proximity to the Dalles and Mont-à-Peine waterfalls. The Chic Cottage is located within walking distance to the Chutes Mont-à-Peine Regional Park and the Dalles at Sainte-Mélanie (Québec, Canada). The cottage is a casual 20 minutes drive north of Joliette in the Lanaudière region. The journey from Montréal is roughly one hour. 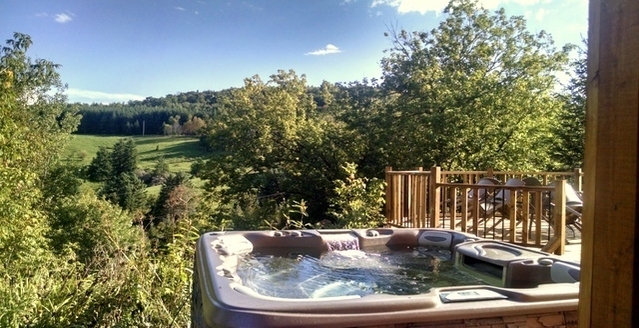 The Chic Cottage is a spacious cottage near many regional trails through hills, valleys, rivers and streams. It offers five rooms with a large comfortable lounge, a fully equipped kitchen and an outdoor balcony with panoramic views. A warm indoor fireplace, leather couches, an outdoor BBQ and four bathrooms allow you to have all the amenities for luxury living in the countryside. You will have undoubtedly a great quality stay with family or friends. Choose the Chic Cottage for its comfort, for the restfulness of its natural surroundings and for its proximity to the Dalles and Mont-à-Peine waterfalls. The Chic Chalet is located in the heart of a private forest within walking distance to the Chutes Mont-à-Peine Regional Park and the Dalles at Sainte-Mélanie (Québec, Canada). The cottage is a casual 20 minutes drive north of Joliette in the Lanaudière region. The journey from Montréal is roughly one hour. Winter season at the Chic Chalet offers many outdoors opportunities. Our private paths are ideal for cross-country skiing as well as snowshoeing. In the summer, the same amenities become ideal hiking, mountain biking and even horseback riding trails. A vast 3 500 000 square feet domain is at your disposal with a genuine log cabin for a picnic or casual breather halfway through your hike. Choose the Chic Chalet for its comfort, for the restfulness of its natural surroundings and for its proximity to the Dalles and Mont-à-Peine waterfalls.